234 pages | 28 B/W Illus. 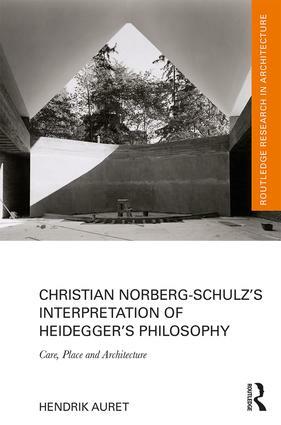 Christian Norberg-Schulz’s Interpretation of Heidegger’s Philosophy investigates the theoretical contribution of the world-renowned Norwegian architectural theorist Christian Norberg-Schulz and considers his architectural interpretation of the writings of German philosopher Martin Heidegger. Though widely recognised as providing the most comprehensive reading of Heideggerian philosophy through the lens of architecture, this book argues that Norberg-Schulz neglected one of the key aspects of the philosopher’s contributions: the temporal nature of being-in-the-world as care. The undeveloped architectural implications of the ontological concept of care in his work prevented the fruition of his ultimate aim, transforming the ‘art of place’ into an ‘art of living’. This book seeks to realign Norberg-Schulz’s understanding of time as continuity and change to present a holistic approach grounded in Heidegger’s phenomenological philosophy; architecture as art of care. Aimed at academics and scholars in architectural theory, history and philosophy, Christian Norberg-Schulz’s Interpretation of Heidegger’s Philosophy surveys the implications and significance of Norberg-Schulz's works on architectural criticism in the late 20th century. "In many ways, Christian Norberg-Schulz’s place theory is more relevant today than when it was first written. That is why Hendrik Auret´s book is important and timely. The book provides a comprehensive consideration of Norberg-Schulz’s lifelong search for a deeper understanding of how architectural work is related to life. Auret´s research is attentive and thorough, and he presents his work regarding the "art of care" as a way towards designing and appreciating architecture as an art of life." Hendrik Auret is a senior lecturer at the University of the Free State (UFS), South Africa, and registered as a professional architect. In 2007 he won the National Corobrik Architectural Student of the Year Award, the title accorded the best master’s design dissertation from all South African architecture learning sites. Hendrik received his Ph.D. in architecture from the UFS in 2015. This is his first book.